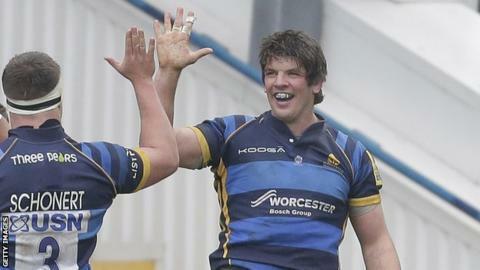 Worcester Warriors second-row forward Donncha O'Callaghan says the club's defensive coach Simon Cross deserves credit for their upturn in form. "I love working with him," said the 37-year-old former Ireland international. "It's tough but you get challenged. Crossy does an awful lot of work with guys individually as well as a group." Warriors have won their last four games to move 16 points clear of bottom club London Irish and all but seal their Premiership survival. The season has picked up dramatically over the last six weeks, Dean Ryan's side having won five of their last six matches. And O'Callaghan, who arrived at Sixways last summer, is adamant the improvements in their defensive line has been key. "Crossy looks at you and, even at 37, he sees you as someone who can learn and improve in the type of defence he wants you to play," O'Callaghan told BBC Hereford & Worcester. "It gives you massive energy when the coaches give you a play or pattern out on the pitch and you do and get a result out of it. Everyone grows a bit." Fellow Warriors lock Darren O'Shea, who has been displaced by O'Callaghan this season, is to return to his old club Munster at the end of this season. After signing in May 2014, he was a regular in Warriors' 2014/15 Championship and British & Irish Cup-winning campaign. Meanwhile, Warriors centre Max Stelling has been selected to play for England in the HSBC World Sevens Series in Hong Kong (8-10 April). With only four games to play, Worcester have virtually banished fears of an immediate return to the Championship and can now focus on potentially catching Bath, Gloucester and Sale above them in the table. "We're now looking at a process - how we can put into practice what were saying in the week," said O'Callaghan. "Results have fallen out the back - before we were all worried about getting the result and not about how we do it. "There's a maturity in the squad now and the coaches have done a fantastic job."